Cosmology is the study of the origin and fate of the Universe as a whole and seeks to understand the physics of the formation and evolution of cosmic structures. By examining the evolution of the Universe over the past 13.8 billion years since the Big Bang, we see the growth of complex cosmic structures from an almost homogeneous medium - when the universe was in its infancy - into a vast network of filaments and voids known as the cosmic web. Zooming to smaller scales, we realize that these filaments are not smooth entities but made of individual, almost spherical halos onto which matter has collapsed. In the standard model of Cosmology, these halos consist of mostly of dark matter but also of ordinary (“baryonic”) matter in the form of diffuse gas as well as stars, stellar remnants, and planets. The existence of dark matter is inferred by its gravitational effect on luminous matter, observed as the diverse galaxy population we see today. Dark matter halos span a vast range of scales and host galaxies of various sizes: from tiny dwarf galaxies weighing a “mere” million suns, to grand-design spirals and giant elliptical galaxies coming in at hundreds of billions of solar masses. Finally, these galaxies themselves can be found in enormous clusters that contain thousands of galaxies. Our research program aims at understanding the physical processes leading to the formation and evolution of cosmic structures from the first galaxies that form and then reionize the universe, to the intergalactic medium and the present population of galaxies and clusters of galaxies. In our group, we tackle these challenging problems with a combination of paper-and-pencil theory and an advanced simulation technique that employs a moving mesh as the underlying numerical structure (as realized in the Arepo code); thus offering an unprecedented combination of accuracy, resolution and physical completeness. We also use other numerical methods, which were realized in the codes Gadget and Flash. Our theoretical efforts are complemented with a focused observational program on the non-thermal emission of galaxies and clusters, taking advantage of new capabilities at radio to gamma-ray wavelengths. Such numerical simulations follow the gravitational clustering of dark and baryonic matter, magneto-hydrodynamic processes associated with diffuse gas, the formation of stars and black holes and their back reaction known as "feedback". In particular, we examine how plasmas and high-energy astrophysical processes accelerate cosmic rays and how they exert feedback by imparting their momentum and energy to the thermal plasma. Our computationally expensive simulations are performed on European supercomputers as well as on our computer clusters of the AIP. Below, we explain and summarize the specific research projects pursued within our group: the first six items are grouped along the cosmic timeline, the last five items represent more physics-based investigations, which are nevertheless expected to have an important impact to cosmological structure formation, as well as our database. 11. Cosmological simulations database - CosmoSim. In the early Universe, quantum fluctuations were inflated to macroscopic size according to the theory of cosmic inflation. These fluctuations were then present in the density fields of dark matter, the ionized gas, and the photon field. Once these fluctuations entered the sound horizon of the cosmic plasma, the gravitational attraction in over-dense regions was balanced by the radiation pressure of photons, which lead to propagating acoustic oscillations. The Universe continued to expand and to cool adiabatically. When the characteristic temperature of 3000 K was reached, Hydrogen gas was able to recombine and the Universe became transparent to photons, which freely streamed away from the regions of last scattering. As a result, radiation pressure ceased to act as restoring force and the acoustic oscillations did not get excited any more. The line-of-sight velocity of the photons caused a Doppler boost when streaming out of and into dense regions, which gets imprinted as fluctuations in the cosmic microwave background with a characteristic amplitude of one part in 100,000. Since dark matter does not interact (electromagnetically) with photons, it had time to form tiny potential wells through gravitational interactions before recombination. Once set free from oscillations, the almost neutral primordial gas streams into those wells. The fluctuations continue to grow and accumulate more mass until they become non-linear. As they collapse in on themselves, these primordial dark matter halos decouple from the general Hubble expansion of the Universe. When the continuously infalling gas impacts on to the dense halo gas, shock waves form. These shock waves decelerate the cold gas, thereby converting the kinetic into thermal heat energy at the (low) characteristic virial temperature of the halos. 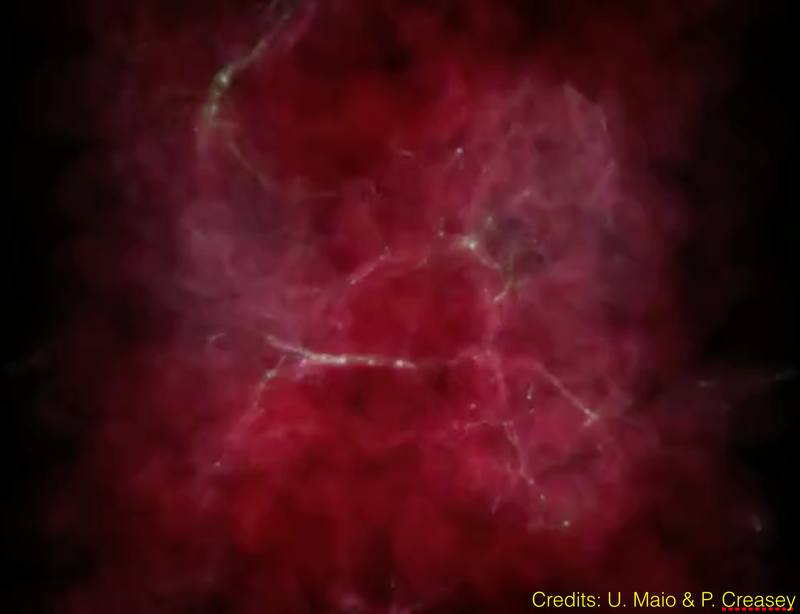 Gas collapsing into filamentary structures in the early Universe. 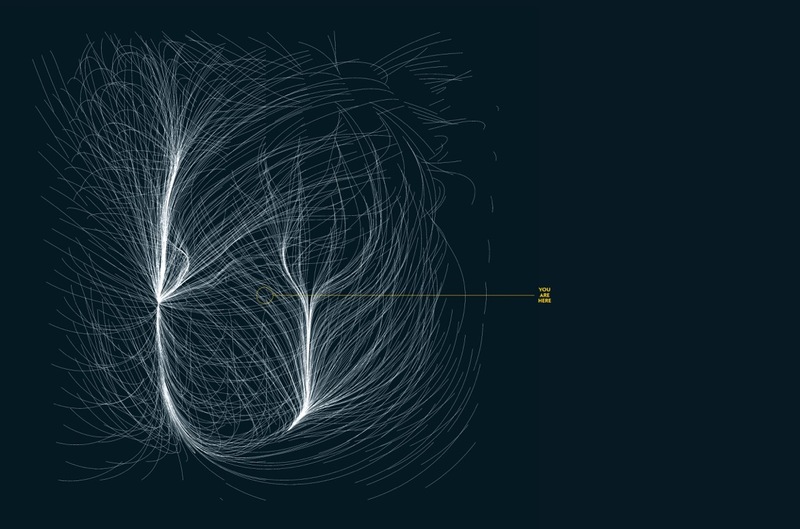 The knots represent the seeds of proto-galaxy formation (Maio & Creasey). The time gas takes to cool in these mini-halos (the “cooling time”) is sufficiently short so that gas quickly cools and collapses to very high densities; cold, high density gas is what is needed to form the first stars in the Universe. On-going star formation leads to the emergence of the first proto-galaxies. In our group, we perform cosmological simulations of the formation of first stars with primordial chemistry (population-III stars) to study their properties. These objects are copious emitters of ultra-violet radiation, which can potentially reionize the primordial gas in the Universe. We also probe the stellar origin of early gamma-ray burst episodes and the occurrence of the first heavy elements in primordial gas. This enables us to explore the role of different feedback effects, to unveil the metallicity patterns in newly polluted material and to investigate metal enrichment signatures of the first stars through observations of high-redshift damped Lyman-alpha systems. By quantifying the emission of primordial star forming regions, we aim at inferring the observability of proto-galaxies with current and upcoming observational facilities, such as ALMA, SKA, and ATHENA. Once the dark matter halos reach the size of dwarf galaxies, gravitational attraction becomes stronger than the gas pressure. As a result, the gas collapses, becomes denser and radiatively cools in order to form a rotating gas disk in the halo center. Stars start to form in this disk and we witness the birth of a disk galaxy. Since the cooling time of the gas is considerably shorter than age of the galaxies, eventually all gas should have cooled, collapsed and formed stars. But this does not happen: while only 20% of the available gas is converted to stars in Milky Way-sized galaxies, even less (about 1% of the gas) ends up in stars in dwarf galaxies. 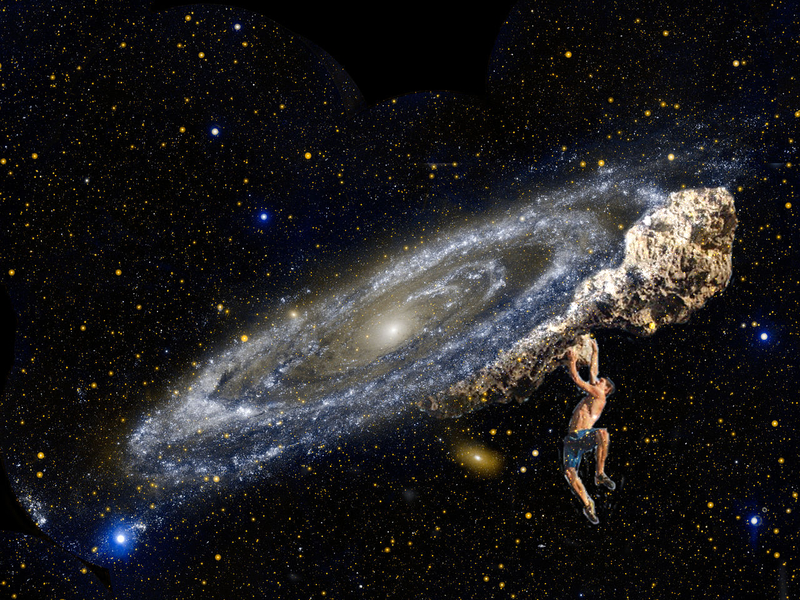 Cragsman logo: A composite image of a cragsman challenged by our neighboring Andromeda galaxy (NASA/JPL-Caltech/Pfrommer). Understanding the physics behind this conundrum of galaxy formation is arguably among the greatest problems in modern astrophysics. Recent cosmological simulations have demonstrated that “feedback" by star formation, supernovae and accreting super-massive black holes (so-called active galactic nuclei) appears to be critical in obtaining realistic disk galaxies, to reduce star formation to the slow observed rates and to move gas and metals out of galaxies into the intergalactic medium. This process still has the caveat that “feedback" is modeled phenomenologically and must be tuned to reproduce observed global relations, substantially weakening the predictive power of hydrodynamic simulations. Cosmic rays consist of charged elementary particles that move incredibly fast, close to the speed of light. Just now, one century after the discovery of cosmic rays, we are starting to understand the astrophysical mechanisms underlying the acceleration of ordinary elementary particles to these enormous velocities: powerful shock waves either driven by exploding stars or by the effects of accretion onto supermassive black holes. Are these cosmic rays just an astrophysical curiosity or do they play a decisive role in the evolution of cosmic structures? 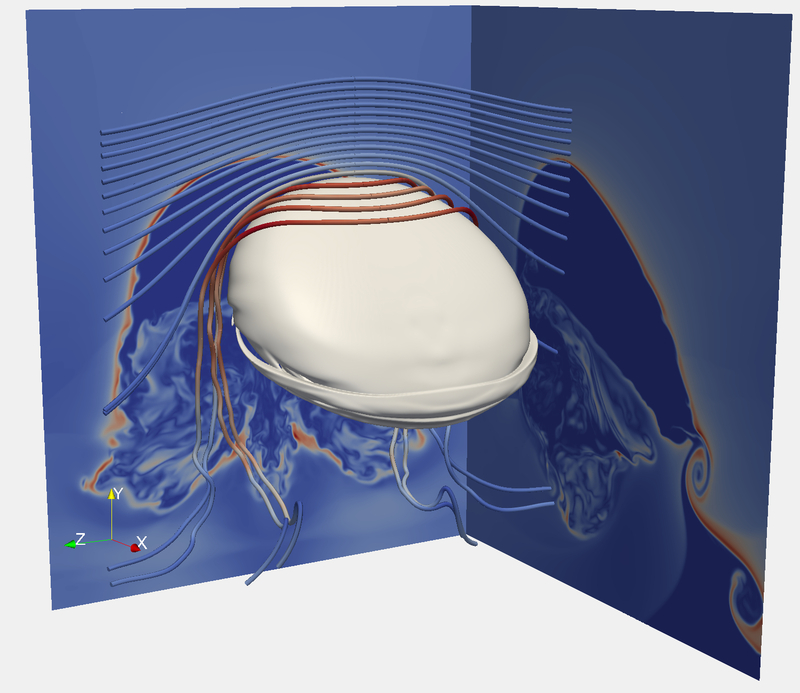 Magnetic draping in a high-resolution magneto-hydrodynamiocs simulation. As the galaxy moves upwards through a weakly magnetized medium a sheath of strong magnetic field is draped around it (Pfrommer & Dursi 2010). This is one of the central questions that our research would like to answer. First indications point to the possibility that cosmic rays could be responsible for driving powerful gaseous outflows during the formation of galaxies; thus explaining the low star formation observed and solving a major problem of galaxy formation. We are currently working on extending the implementation of cosmic ray physics in the Arepo code to follow the momentum spectrum of hadrons and leptons; we face a challenging five-dimensional problem. Solving this problem enables us to more faithfully follow non-adiabatic cosmic ray cooling, active cosmic ray transport, and non-thermal radiative signatures at radio and gamma-ray energies. We will carry out galaxy formation simulations in an idealized and cosmological framework that self-consistently follow cosmic ray physics and magneto-hydrodynamics. We study the emergence of galactic magnetism that grows via small-scale turbulent and large-scale galactic dynamo processes. We also explore the properties and launching mechanisms of cosmic ray-driven galactic winds, their ability to regulate star formation and to enrich the circumgalactic medium with metals and magnetic fields. The European Research Council (ERC) has funded the Project CRAGSMAN: “The Impact of Cosmic Rays on Galaxy and Cluster Formation" as a Consolidator Grant within the European Union's Framework Program for Research and Innovation, Horizon 2020, for a period of 60 months, starting in 2016. In the course of cosmic evolution, galaxy-sized halos merge with each other to form larger and larger objects, which constitutes the hierarchical growth of cosmic structure. Eventually, galaxy halos merge to form groups of galaxies which themselves merge, culminating in the largest gravitationally bound objects in the Universe: galaxy clusters. Forming at sites of constructive interference of long waves in the primordial density fluctuations, galaxy clusters can be found at the knots of the cosmic web. The gravitational binding energy of galaxy clusters attracts galaxy groups and gas in the cluster vicinity, which accrete and - upon colliding with the cluster gas - form enormous shock waves at cluster boundaries that heat the gas to X-ray emitting temperatures of T ~ 108 K. Rare clusters mergers are the most energetic events in the Universe (after the Big Bang). The accelerated expansion of the Universe, caused by dark energy, delays and eventually stops structure formation. Hence, galaxy clusters sit atop the cosmic mass hierarchy and will remain forever the largest bound objects in our Universe! Energy dissipation by cosmic shock waves around a massive galaxy cluster. The brightness scales (logarithmically) with the dissipation rate and the colors indicate the shock strength using Mach numbers (Pfrommer et al. 2008). Similar to galaxy formation, cosmic rays can also play a critical role during the evolution of galaxy clusters, which are an important touchstone in understanding formation in our Universe. However, the thermal history of clusters remain mysterious; some central regions should have long since cooled and collapsed, which constitutes the famous "cooling flow problem". Instead, the most massive black holes in the Universe, which are situated at the center of these galaxy clusters, appear to heat the cooling gas at just the right rate. But how does this mechanism work? Again, elusive cosmic rays could come to the rescue and provide the necessary stable heating mechanism. To this end, we are advancing the state-of-the-art in modeling active galactic nuclei feedback by explicitly modeling jets composed of cosmic rays and magnetic fields, aiming at solving the cooling flow problem. We will undertake the challenge to improve our understanding of physical processes leading to the cluster bimodality of cool-core and non cool-core clusters. Generally, galaxy clusters provide the opportunity to study an "ecosystem" - a volume that is a high-density microcosm of the rest of the Universe. Clusters are signposts for early structure formation and excellent laboratories for studying cosmology, structure formation, and high-energy astrophysics. Current interesting questions include, e.g., how do non-equilibrium processes such as cosmic rays, magnetic fields, and turbulence modify the formation and evolution of galaxy clusters? Do these astrophysical processes jeopardize the use of clusters for cosmological parameter estimation and our quest to understand the dynamical evolution of dark energy with cluster observations? How can galaxy and cluster observations throughout the entire electro-magnetic spectrum from radio to X-ray to gamma-ray wavelengths help in gaining important insight into the underlying plasma physics, high-energy astrophysics, or astroparticle physics, in particular help in elucidating the nature of dark matter? We hope to solve some of these important questions in the upcoming years within our group. The peculiar velocities of galaxies near the Local Group. Libeskind & Tully, (C) Scientific American. In the vastness of outer space, gravity is the only force at work: it keeps the moon in orbit around the Earth, the planets in orbit around the Sun, our Sun tied to the Milky Way and our Galaxy bound to the Local Group, an ensemble of a dozen or so dwarf galaxies that define our cosmic tribe. Gravity determines the motion of the Local Group through intergalactic space, as it is pulled by large neighbouring galaxies like the radio blasting Centaurus A or the giant elliptical galaxy M87. But our cosmic coordinates do not stop with our association to the Local Group. The Local Group is small association floating towards the Virgo cluster, a bundle of around 2000 galaxies that swarm randomly around a common focus. Until recently the Virgo cluster was believed to be the frontier of what we could define as "home". Beyond it lay a vast universe to which we could lay no claim. Recent studies, that focus on the motions (instead of the positions) of galaxies reveal the Virgo cluster to be a relatively small appendage to larger consortium, recently named as the Laniakea supercluster. Laniakea itself is probably affiliated with the Shapley super cluster. The Local Universe is shown here as a section of the super galactic plane. Both the density (color) and the corresponding velocity field (flow lines) are Wiener Filter reconstructions obtained from the CosmicFlow-2 radial peculiar velocity catalogue, which recover the observed structure in local cosmic neighborhood remarkably well (Libeskind et al 2015). Charting the universe is a difficult task, one that requires both precision instruments and advanced techniques. Furthermore, once galaxies have been photographed and their positions mapped, their interconnectedness needs to be established. In this collaboration we strive to advance techniques to tackle both of these challenges. On one hand we apply for time on facilities such as the Hubble Space Telescope in order to acquire images of faint dwarf galaxies. On the other we analyse their spatial distribution and try to asses how the local universe was created - how the dwarf galaxies in the Local Group were formed and what the role of the cosmic web is in shaping our environment. We develop techniques to quantify the cosmic web and relate it to our cosmic coordinates. Lead Investigators: Noam Libeskind, Stefan Gottloeber, Matthias Steinmetz, Edoardo Carlesi, Peng Wang, (all AIP), Elmo Tempel (Tartu), Jenny Sorce (AIP, Strasbourg), Yehuda Hoffman (Jerusalem), Brent Tully (Hawaii), Helene Courtois (Lyon), Daniel Pomarede (Saclay). 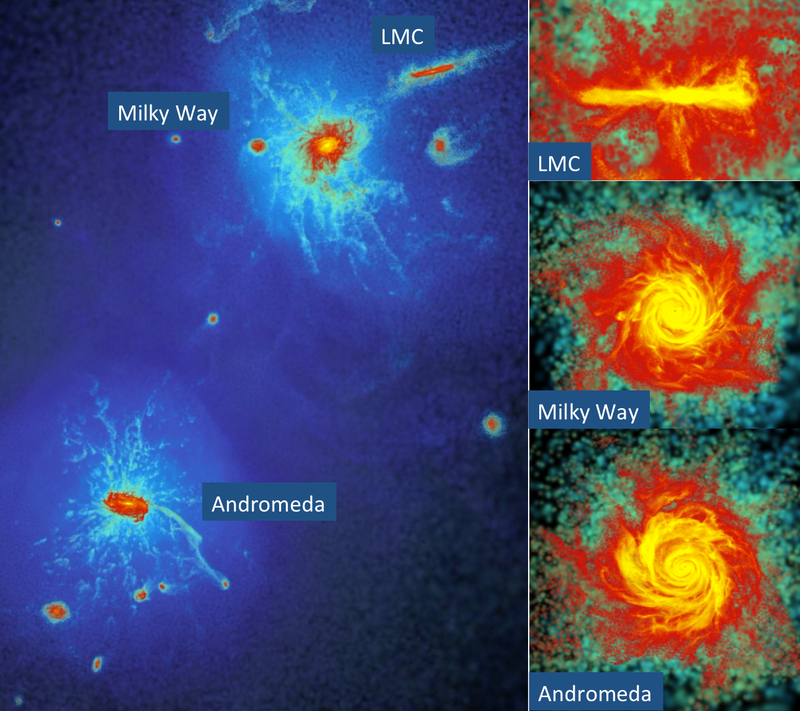 Cosmological simulations have become the standard tool to test theories of structure growth and galaxy formation in the non-linear regime. Traditionally these tests are carried out in a statistical sense. Namely, a cosmological model is chosen and a power spectrum of fluctuations is used to construct a (Gaussian) random realisation of the primordial density field. 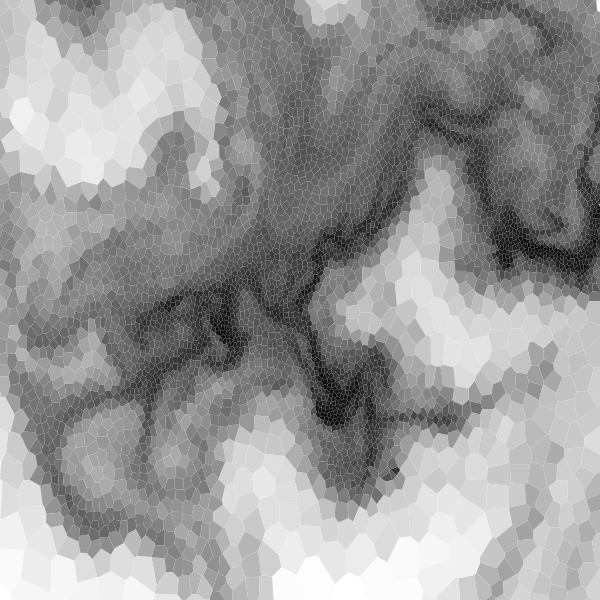 The growth of these perturbations is evolved numerically from high redshift until today. Dark matter distribution in our Local Universe in two different simulations indicating prominent structures surrounding us. Shown is a box with 160 Mpc/h side length (big picture) and with 64 Mpc/h side length (inset panel). While hugely successful, the approach is by construction statistical and thus runs into trouble when specific cosmological structures are sought. For example, cosmography of the local universe has revealed a very well defined “landscape” with features such as the Virgo and Coma cluster, the great attractor, the great wall, the local void and the Shapley super cluster. Not only are there important cosmographic features like the ones just mentioned, but our dynamical environment — the dipole of the cosmic microwave background and our bulk flow - also demand an explanation. One way of addressing this is to constrain the initial conditions in a way which forces the simulation to converge towards a pre-determined input (namely todays local density and velocity field). This is achieved by a technique known as “constrained simulations”. The CLUES collaboration, one of the leaders in the field, aims at producing such constrained initial conditions for hydrodynamic simulation. 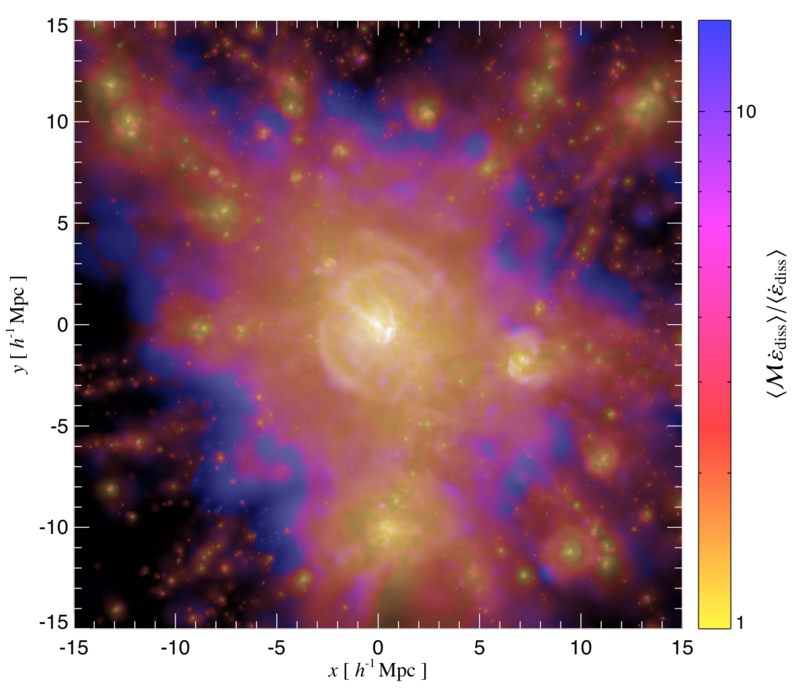 To improve the generation of constrained initial conditions for realistic numerical simulations of the local environment, we will complement observed radial peculiar velocity constraints of the Cosmic-Flows survey with density constraints, derived from galaxy redshift surveys. This is expected to increase the masses of nearby galaxy clusters so that they match observational data. We anticipate that this will improve our understanding of the formation of the Local Group and the structure of the local environment, the "Holy Grail" in near field cosmology. We are currently producing high-resolution magneto-hydrodynamics simulations of the Milky Way and Andromeda galaxy embedded in their local cosmic environment within the context of the HESTIA project. This project employs the Auriga galaxy formation model of the Arepo code, which accounts for a large number of physical processes "sub-grid” such as black hole growth, star formation and various forms of feedback. The project has been awarded 30 million computing hours on the SUPERMUC machine at LRZ/Garching. We will produce nested suites of constrained simulations with increasing resolution to understand the effects of our cosmic environment on the formation of the Local Group: starting with some 500 low-resolution simulations, we select the best systems for resimulation at progressively higher resolution, in order to arrive at the golden five simulations at very-high resolution (Mcell ∼ 105 M⊙). The gas distribution of a simulated the Local Group. The Hestia simulation project will simulate the same environment, but include more realistic physics and use a higher resolution. This project enables us to address many scientific question ranging from galactic (chemo-)dynamics, to properties of Local-group dwarf satellites, to the growth of the Galactic magnetic field and how it affects the propagation of ultra high-energy cosmic rays. Comparison to the sample of 30 simulated Auriga galaxies, which have been selected to form in isolation, allows addressing the effect of the Andromeda galaxy and the Local-group environment on properties of the simulated Milky Way galaxy and its satellite system. This project is expected to provide am excellent data base for comparison to current and future observations (Gaia, RAVE, APOGEE, 4MOST, ...). The space in between the stars is not empty but filled with a diffuse medium out of which new stars are born and to which the products of exploding stars such as heavy metals are delivered once the stars end their lives. This constitutes the interstellar medium, which consist of different phases: from cold and dense molecular clouds that harbour the birthplaces of stars to a hot phase that is created by powerful blast waves of exploding supernovae. Studying the complex interplay of these various phases is not only important for understanding the life cycle of elements but also critical for better understanding galaxy formation since feedback processes impart momentum and energy into the interstellar medium. These processes won't unfold their full potential if the different phases are not modelled as realistically as possible. A 1000 degree cold cloudlet (dark colours) moves in a dilute hot wind of one million degree (white colours). The hot wind deforms the small cloud, leading to the irregular shape seen in the image (Sparre in prep.). To this end, we simulate the chemical and dynamical evolution of the multiphase interstellar medium on scales between 1 pc and a few kpc. These Arepo and FLASH simulations (within the SILCCcollaboration) use stratified boxes with conditions resembling the solar circle and include magneto-hydrodynamics augmented with cosmic ray physics and self consistent gravity, and follow the thermal evolution using a multi-fluid chemical network with self-shielding. The goal is to understand how supernova-driven supersonic turbulence, cosmic ray pressure and radiative transfer of ultra-violet stellar radiation amplify the magnetic field and self-regulate the interstellar medium. We aim at quantifying the conditions responsible for driving outflows from the disk. In order to move towards more realistic models, which exhibit differential rotation and allow an acceleration of the outflow due to geometric expansion, we plan to simulate the interstellar medium dynamics within a global (dwarf) disk. These simulations are complemented with idealized super high resolution wind-tunnel Arepo simulations that aim to understand the physics of shattering cooling gas into a cold fog that is embedded in a hot pressurized atmosphere. To do this requires numerically resolving sub-parsec scale droplets of cold gas. We are developing an efficient refinement methodology that allows us to directly simulate the physics of shattering gas in a small volume within a global galaxy formation simulation and to produce mock spectra, which we compare to data. This project has the potential to explain Lyman-alpha halos (observed by MUSE), high velocity clouds in our Milky Way, and the acceleration and entrainment of a cold phase into (cosmic ray driven) galactic outflows. To improve our understanding of the macroscopic description of cosmic ray transport, we simulate the microphysics of cosmic ray streaming with kinetic plasma (particle-in-cell) codes. We are developing a coarse-grained hydrodynamic description of cosmic ray streaming and explore the relative importance of the different modes of cosmic ray transport (streaming versus diffusion) for the range of plasma parameters that we encounter in galaxies and clusters. We will validate results of local simulations of cosmic-ray propagation in a multiphase medium to observational cosmic ray data. 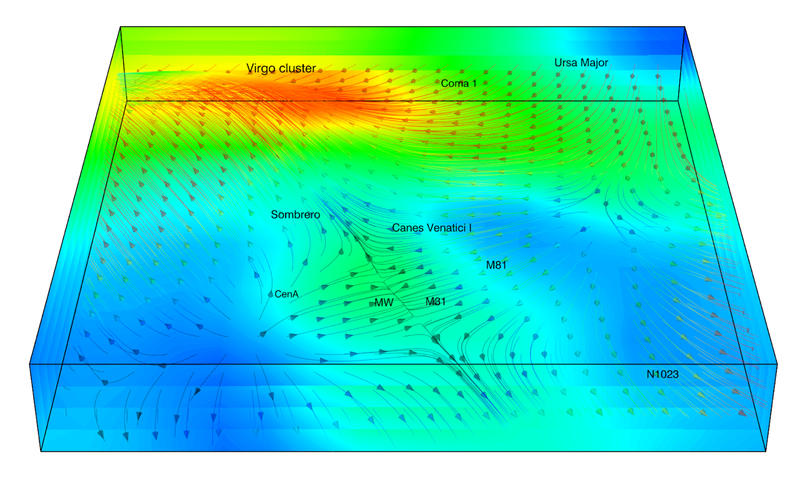 Implementing Braginski magneto-hydrodynamics in the Arepo code, we will perform simulations of the intra-cluster medium. This will enable us to scrutinize whether mirror instabilities driven by anisotropic pressure distributions in the collisionless intra-cluster medium are indeed decreasing the transport coefficients of heat and cosmic ray energy density along the magnetic field. One of the last exciting observational frontiers in high-energy astrophysics is the TeV gamma-ray sky. To our surprise, we have recently learned that the extragalactic gamma-ray sky is dominated by "blazars". These are a subclass of super-massive black holes, which are situated at the center of every galaxy and drive powerful relativistic jets and electromagnetic radiation out to cosmological distances. The Universe is opaque to the emitted TeV gamma rays because they annihilate and pair produce on the extragalactic background light emitted by stars in galaxies. The resulting ultrarelativistic pairs of electrons and positrons are commonly assumed to lose energy primarily through inverse Compton scattering with photons of the cosmic microwave background, cascading the original TeV emission a factor of one thousand down to GeV energies. Artist's impression of a super-massive black hole that launches relativistic jets which carry enormous power out to cosmological distances. Blazars are systems where the jet is pointing at us; (C) ESA/NASA/AVO-project/Padovani. However, there are two serious problems with this picture. The first is that the expected cascade of GeV emission is not seen in the individual spectra of blazars. Secondly, the emission of all unresolved blazars would overproduce the observed GeV gamma-ray background if these objects share a similar cosmological evolution as the underlying black hole or parent galaxy population. As a putative solution to the first problem, comparably large magnetic fields have been hypothesized which would deflect the pairs out of our line-of-sight to these blazars. However, it would be a challenge to explain these magnetic fields astrophysically, in particular in void regions in between the filamentary cosmic web. Hence, we have recently found an elegant solution to both problems and argue that there is an even more efficient mechanism competing with this cascading process. Powerful plasma instabilities driven by the highly anisotropic nature of the ultra-relativistic pair distribution provide a plausible way to dissipate the kinetic energy of the TeV pairs locally, heating the intergalactic medium. This naturally solves the two mysteries introduced above in a unified model of blazars and their underlying black hole population without the need to invoke large magnetic fields. Our new model matches the number evolution of these objects observed by the Fermi gamma-ray space telescope as well as the extragalactic gamma-ray background above GeV energies extremely well. 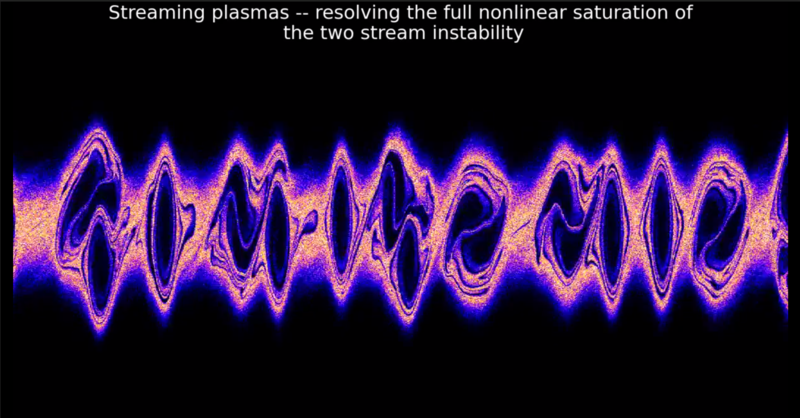 Particle-in-cell simulation of a counter streaming plasma that fully resolves the nonlinear saturation of the two stream instability (Shalaby et al. 2017). This provides a novel heating mechanism of the gas that fills the space in between galaxies, with a number of important implications for cosmological structure formation. 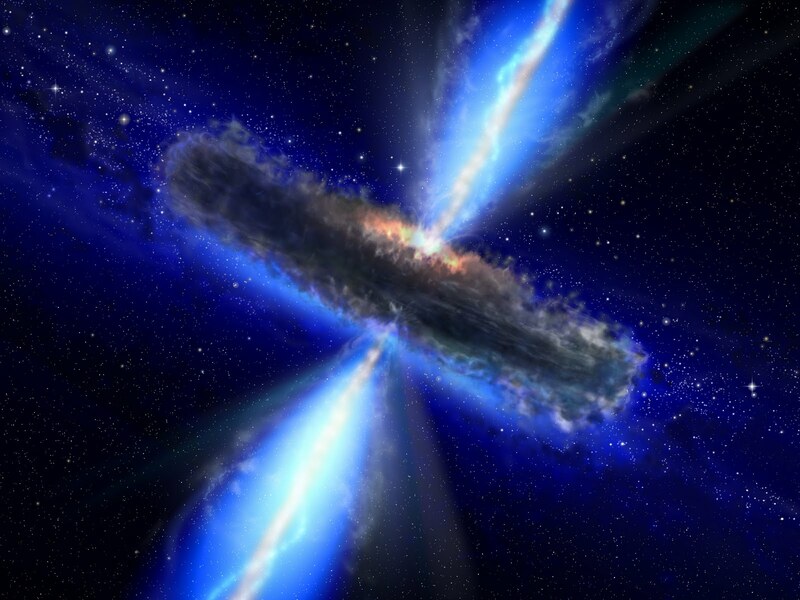 (1) At late times, "blazar heating" deposits more energy per baryon in cosmic voids. This unique property in combination with the increased temperatures is needed to solve many problems present in previous numerical simulations of Lyman-alpha forest spectra. (2) The additional heat increases the pressure of the intergalactic gas at late times, which withstands the gravitational collapse of gas and prevents the late formation of dwarf galaxies. This may partially help resolve the "missing satellites problem" (namely the fact that fewer dwarf satellite galaxies are observed around the Milky Way then predicted by cold dark matter simulations) and may bring the observed early star formation histories into agreement with galaxy formation models. At the same time, it could explain the "void phenomenon" by suppressing the formation of galaxies within existing dwarf halos, thus reconciling the number of dwarfs in low-density regions in simulations and the paucity of those in observations. Lead investigators: Christoph Pfrommer, Ewald Puchwein, Mohamad Shalaby, (AIP), Avery Broderick (Perimeter/U of Waterloo), Phil Chang (UW Milwaukee), Astrid Lamberts (Caltech). Dark matter is a radical concept that introduces new physics beyond the standard model of particle physics. Following Occam's razor, the emerging standard model of cosmology favors the "cold dark matter scenario", which postulates a new elementary particle that interacts with baryonic matter via gravitation only and requires no other fundamental interaction. On large cosmological scales, this empirical model has been able to successfully explain all different cosmological observations and tests. However, on small scales there are a number of puzzling results that may or may not be fully explained within this model. This is because the standard model of cosmology is not predictive on these scales due to the very complex gas-dynamical processes that are mainly responsible for the luminosity of galaxies. How can we test this cold dark matter paradigm? While the standard model of particle physics requires 3 fundamental forces (other than gravity) would it be natural to assume that there is no new fundamental interaction in the dark sector? If not, what experiment could we design to probe and constrain such a hypothetical new dark-sector interaction? Interaction processes that set the dark matter relic density and may lead to observable neutrinos today (left), change the inner density of dwarf halos (middle) and induce a large cutoff in the spectrum of primordial density perturbations (right, van den Aarssen et al. 2012). To answer these questions, we formulate an Effective THeory Of Structure formation (ETHOS) that enables cosmological structure formation to be computed in almost any micro-physical model of dark matter physics. This framework maps the detailed micro-physical theories of particle dark matter interactions into the physical effective parameters that shape the linear matter power spectrum and the self-interaction transfer cross section of non-relativistic dark matter. These are the input to structure formation simulations, which follow the evolution of the cosmological and galactic dark matter distributions. Models with similar effective parameters in ETHOS but with different dark particle physics would nevertheless result in similar dark matter distributions. 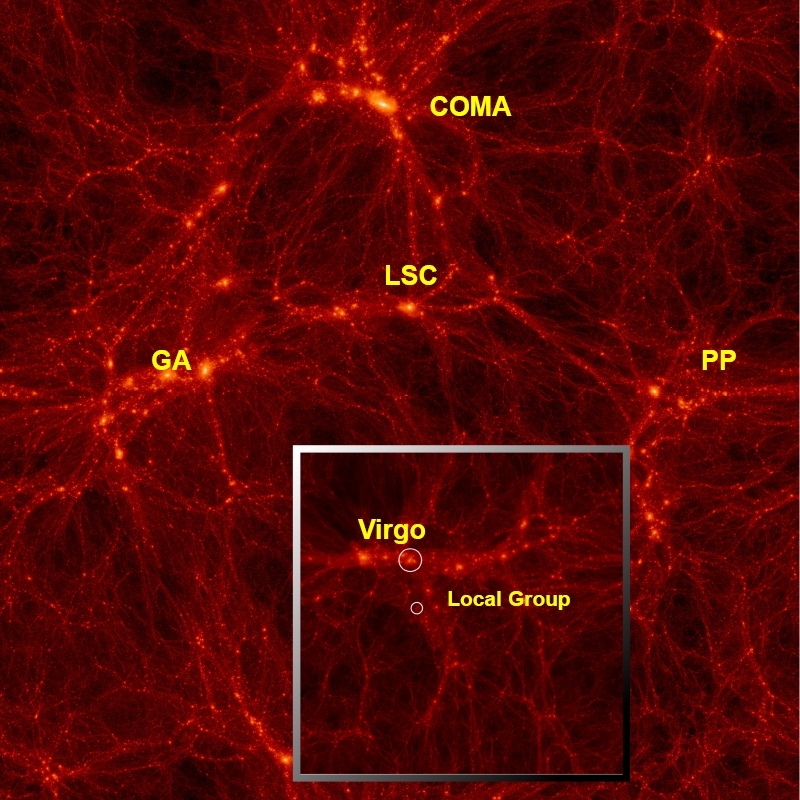 Taken together, these effective parameters in ETHOS allow the classification of dark matter theories according to their structure formation properties rather than their intrinsic particle properties, paving the way for future simulations to span the space of viable dark matter physics relevant for structure formation, including galaxy formation (at the faint and bright end), reionization, and the Lyman-alpha forest. 11. Cosmological simulations database -CosmoSim. As a service to the community, the CosmoSim database provides results from cosmological simulations performed within different projects. So far it hosts the MultiDark and Bolshoi project, and the CLUES project. In the future, we plan to enter HESTIA and CRAGSMAN simulation data products. The database can be queried by entering SQL statements directly into the Query Form or via Scripted access. Main research topics are Statistical analysis of large scale structure, Baryonic oscillations and Cosmological models. Investigators (in alphabetic order): Andrew Benson (Carnegie), Sofia A. Cora, Darren Croton (Swinburne), Harry Enke (AIP), Anastasia Galkin (AIP), Stefan Gottloeber (AIP), Noam Libeskind (AIP), Anatoly Klypin (NMSU), Alexander Knebe (UAM), Kristin Riebe (AIP), Matthias Steinmetz (AIP), Gustavo Yepes (UAM).